We are all looking for easy ways to reduce stress and tension and get a better night’s sleep. But have you ever thought that what you’re looking for could be an adult colouring book? Regularly on the top selling books lists in the world, adult coloring books are being hailed as the next best thing to meditation – but why should you pick up your coloured pencils and settle down to colour in? From an early age I can remember spending hours and hours with pencils, pens and crayons colouring and shading and trying to stay within the lines (that is a whole other blog post subject lol). But as I got older I learned somewhere that academic studies were how I should be spending my time rather than creativity. So to sit and colour in seemed a frivolous waste of time, which I admit I did do – but what if all that time there was more to colouring in than meets the eye? Are adult colouring books beneficial? Researchers have been studying the benefits of this child’s pasttime for well over a decade, and research continually supports the findings that it is in fact beneficial for reducing stress and is a practical alternative to meditating for those of us who can’t sit still for long. The benefits of meditating are well know, but if you are anything like me you may find it difficult to quieten the inner chatter of your mind. Colouring has a meditative effect on the mind and the hands on nature of the activity allows you to switch off from the never ending to do list. Painting, doodling, crafts, gardening etc have similar effects and are to be recommended. But the great thing about colouring is the design is already created for you, it is easy to follow and removes some of the need for active thought and you can stick it in your handbag and do it anywhere. Colouring aparently calms the amygdala, the part of the brain related to the stress response. It has also been shown to stimulate the parts of the brain responsible for creativity and logic. Trials have even shown that colouring for a short time before bed can actually help you sleep better. Group colouring social activity is becoming very popular in the US. The great thing about colouring in a group is it’s not hard. You don’t need to concentrate and it can be done while having a good social time with others. Plus if you have kids it’s a fun activity you can do with them, they can have their colouring books and you can have yours. What if you could combine colouring with actual meditation? I often get my clients to tune into their creative thinking, and tap into their intuition by using simple creative activities. Repetitive doodling or colouring is a very quick way to tap in. 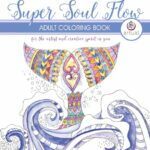 Last year I co-authored the ‘Supersoulflow colouring book’ with 16 other artists, and each drawing has its own meditation – that is how much I believe this works! Why not try an adult colouring book whilst listening to a meditation track – there are heaps on the internet. Find some space to sit quietly and enjoyed some quality time with yourself. Put on the meditation, choose your favourite colour pencil or marker pen and get colouring. You will find that while you are colouring your inner creative may come up with some new ideas. Or answers to some of your problems – just jot them down, down’t spend any time or energy on working them out. Then get back to your colouring and then check out what you wrote later. I have had some of my best ideas when colouring in – so let me know how you get on. Having trouble relaxing and need a solution? Reach out today Book a FREE discovery session with me and let’s see how I can help.